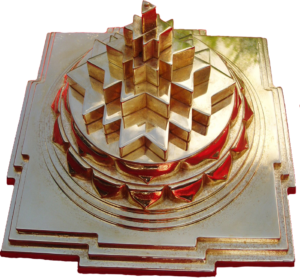 Highly sensitive, with magnificent magnetic powers, the Sri Yantra manifested as the Meru chakra is said to be a divine store-house of energy. When placed according to the guidelines and unlocked with the associated mantra, this pyramid can help to harmonise bio energies and forces that influence us in our environment. The source of this pulse is described as the ecstasy of the Supersoul Paramatma. His pulse maintains the balance of the cosmos. In one part of the spiritual sky He is also known as Sri Narayan who is never without His female counterpart Sri Laxmi. She is the presiding Goddess of the Meru Chakra.